"Fermi Bubbles," which might appear as a void in visible light in spiral galaxies. is the term used by Richard Carrigan at the Fermi National Accelerator Laboratory in his work on the search for cosmic-scale artifacts like Dyson spheres or Kardashev civilizations. A Fermi bubble would grow as the civilization creating it colonized space, according to Carrigan. A variety of interstellar archaeology signatures could include non-natural planetary atmospheric constituents, stellar doping with isotopes of nuclear wastes, Dyson spheres, as well as signatures of stellar and galactic-scale engineering. The concept of a Fermi bubble due to interstellar migration grew out of the the discussion of galactic signatures. These potential interstellar archaeological signatures are classified using the Kardashev scale, developed by Nikolai Kardashev, who divided civilizations into those harvesting all the energy of a planet, of a star, and of a galaxy. With few exceptions interstellar archaeological signatures are clouded and beyond current technological capabilities. However SETI for so-called cultural transmissions and planetary atmosphere signatures are currently under way. According to the Kardashev scale, radio SETI might be a type 0 civilization. A type I civilization would utilize the energy available from a planet. Signals from exosolar planetary atmospheres fall roughly in this category. A Dyson Sphere, a star cloaked in broken up planetary material, would be an example of type II. Another example would be some sort of engineering of the stellar burning process suggested by Martin Beech. A civilization using all of the energy of a galaxy would be type III. James Annis,a member of Experimental Astrophysics Group at Fermilab, has suggested that elliptical galaxies, which exhibit little structure, might be a more likely place to look for Fermi bubbles than spiral galaxies. Annis examined existing distributions for spiral and elliptic galaxies and looked for sources below the normal trend lines where more than 75% of the visible light would have been absorbed. But no candidates were found in his sample of 137 galaxies. From this Annis inferred a very low probability of a Type III civilization appearing that would be found using this search methodology. In 1960 Dyson suggested that an advanced civilization inhabiting a solar system might break up the planets into very small planetoids or pebbles to form a loose shell that would collect all the light coming from the star. The shell of planetoids would vastly increase the available "habitable" area and absorb all of the visible light. The stellar energy would be reradiated at a much lower temperature. 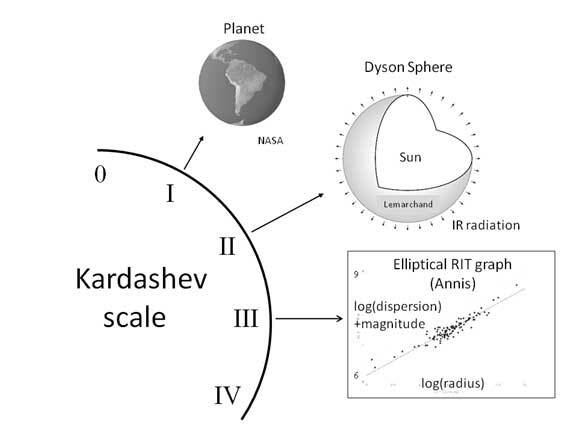 If the visible light was totally absorbed by the planetoids a pure Dyson Sphere signature would be an infrared object with luminosity equivalent to the hidden star and a blackbody distribution with a temperature corresponding to the radius of the planetoid swarm. For the case of the Sun with the planetoids at the radius of the Earth the temperature would be approximately 300 ºK. Many of the earlier searches for Dyson Spheres have looked for so-called partial Dyson Spheres where the loose shell only partially obscures the star. The Dyson Sphere investigation at Fermilab looks for so-called pure Dyson Spheres as well as partial Dyson Spheres. 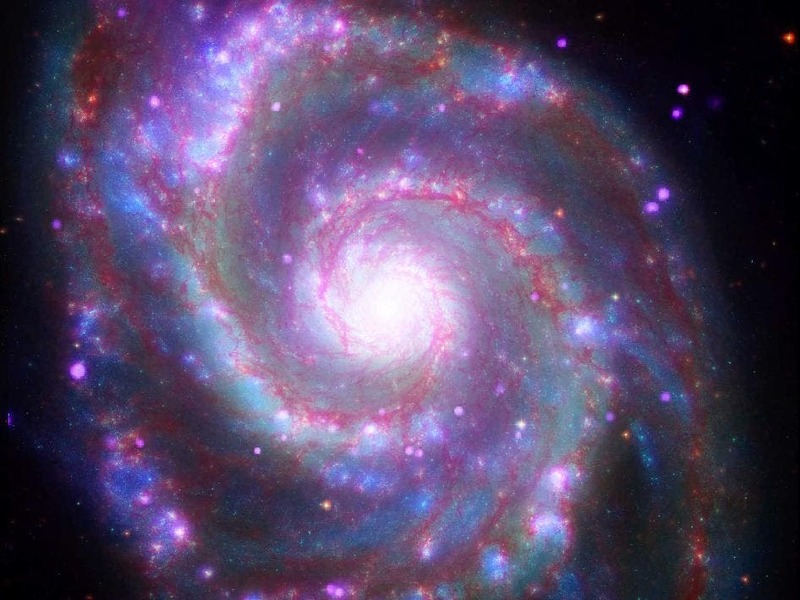 Studying the M51 Whirlpool galaxy (image above), Carrigan says a rough qualitative estimate shows there are no unexplained ‘Fermi bubbles’ at the level of 5 percent of the M51 galactic area. The quest is tricky because spiral galaxy structure includes natural voids — even if a void in visible light with infrared enhancement were traced, it would be hard to regard it as anything other than natural. The distribution of galaxies on a plot of galactic optical brightness or luminosity versus the maximum rotation velocity or radius of the galaxy follows a fairly consistent pattern. Cases lying below the typical galactic trend line reflect visible light that has been absorbed and emitted somewhere else in the electromagnetic spectrum. Looking elsewhere, ynthetic or unnatural constituents in an exoplanet atmosphere could show a sign of ETI. The fingerprints of life, or biosignatures, are hard to find with conventional methods, but advances for eample by the ESO's VLT team in Chile team have pioneered a new approach that is more sensitive. Rather than just looking at how bright the reflected light is in different colours, they also look at the polarisation of the light, an approach called spectropolarimetry. "The light from a distant exoplanet is overwhelmed by the glare of the host star, so it's very difficult to analyse — a bit like trying to study a grain of dust beside a powerful light bulb," says Stefano Bagnulo of Armagh Observatory, Northern Ireland. "But the light reflected by a planet is polarised, while the light from the host star is not. So polarimetric techniques help us to pick out the faint reflected light of an exoplanet from the dazzling starlight." In the attempt to identify Dyson spheres, their use would greatly expand the useful area for activities for any culture that could build them, absorbing most or all visible light and re-radiating the energy of the star at lower temperatures. Various searches for infrared excesses around visible stars –hoping to target a partial Dyson sphere, perhaps a ring — have been attempted, but with no luck from the searches of several thousand stars. Even a pure Dyson sphere, completely surrounding its star, is not definitive because there are natural objects that mimic it, especially since dust clouds surround stars as they are born and as they die. Carrigan used data from the IRAS spacecraft’s database of low resolution spectra, discarding objects that had been previously well categorized and narrowing the sample to sixteen sources that he calls ‘mildly interesting.’ Only three had relatively low spectral statistical fluctuations. All of the sixteen sources have some feature which clouds their identification as a Dyson sphere. The search suggests that there are few if any even mildly interesting candidates within several hundred light years of Earth. Carrigan observes that "a Dyson sphere does not require intent to communicate on the part of a civilization. The current detection reach is comparable to a SETI search. However there is a problem of confounding signatures from mimics such as carbon stars. Searches for potential Dyson spheres would be sharpened by developing more realistic pictures of construction scenarios including such factors as time to build and approaches to stability… "Finally it would be interesting to consider how stellar evolution might stimulate the necessity of such large scale structures with a view to looking at candidate objects in the later stage of evolution along the main sequence." When we search for the type of structures or effects, the "signatures," interstellar archaeology, we acknowledge that they demand technologies so far beyond our own that their construction seems all but miraculous. "We can look for Dyson spheres," Carrigan says, for example, "but scarcely imagine how a culture could build at this scale. But these are limitations of our own state of development, and they don’t keep us from extrapolating to what civilizations far older than our own might be capable of developing."